NBK Capital, one of the region’s leading investment firms, has signed a one-year partnership agreement with GCC Board Directors Institute. 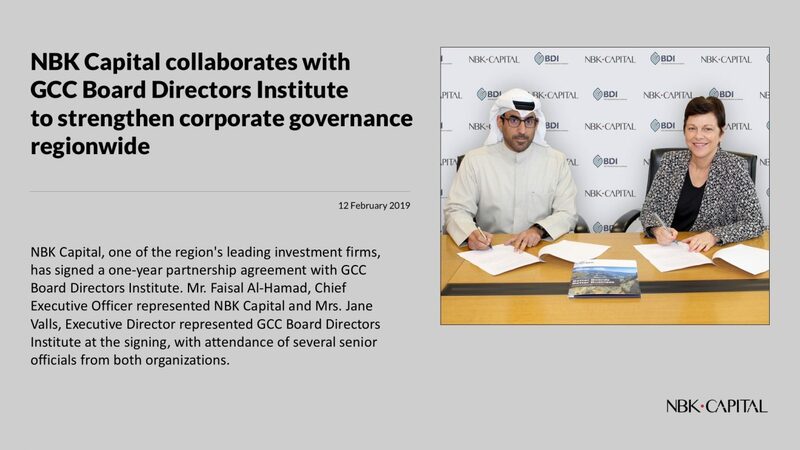 Mr. Faisal Al-Hamad, Chief Executive Officer represented NBK Capital and Mrs. Jane Valls, Executive Director represented GCC Board Directors Institute at the signing, with attendance of several senior officials from both organizations. “This type of partnership contributes to the development of GCC economies by improving the effectiveness of board members and enhancing their business abilities and level,” Al Hamad notes. “We are confident that sharing our expertise with the GCC Board Directors Institute will contribute to promoting best practices at the local and international levels. Enhancing our understanding of business, which is essential for engaging in successful economic activities,” Al Hamad concluded. Founded in 2007, the GCC Board Directors Institute (GCC BDI) is a not-for-profit organization that guides board directors of organizations, from family-owned businesses to listed companies, to acquire the know-how and the tools to reach and sustain effective governance.